Denver is a vibrant, active city with 300 days of sunshine, brilliant blue skies and breathtaking Rocky Mountain scenery. Founded in 1858 as a gold mining camp, Denver is located at the base of the majestic Rocky Mountains, 5,280 feet (1,609 meters) above sea level - exactly one mile high. 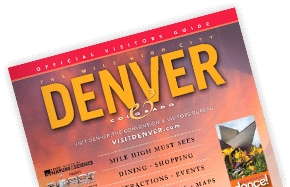 Denver welcomes you to experience, explore and discover why visitors feel at home in The Mile High City. Prepare to shop, take in the sights, and see the best of Denver with our itinerary designed around 3 days in Denver. Built in 1982, the 16th Street Mall is a mile-long pedestrian promenade that runs through the center of Downtown and is lined with outdoor cafes and retail shops. Free shuttle buses cruise the mile-long mall about 90 seconds apart and stop at every intersection so it&apos;s easy to cover a lot of ground in a short period of time. Stop by the official Denver Tourist Information Center located off 16th Street Mall at 1575 California St.
"I See What You Mean," or better known as "The Big Blue Bear," on 14th and California streets, was created by Denver-based artist Lawrence Argent. This delightful 40-foot sculpture, peers curiously into the building, injecting a sense of fun and playfulness into the Colorado Convention Center. Take a photo or two of this only-in Denver icon - he looks good from all angles. An outdoor entertainment and shopping destination, located on the 16th Street pedestrian mall in the heart of Downtown Denver. The Denver Pavilions feature 40 shops, restaurants and entertainment venues including a movie theater and bowling alley. This two city block, three stories high, open-air mall also offers convenient underground parking. 16th Street between Welton and Tremont streets. Open 10 a.m.-8 p.m. Monday-Saturday; noon-6 p.m. Sundays. The Denver Performing Arts Complex is the cultural hub of The Mile High City, encompassing opera, theater, stage, dance and music. A variety of cultural enrichment awaits you — from symphony and orchestral arrangements, jazz and musicals to performances by dance companies, theatrical extravaganzas, one-person shows, plays, stand-up comics and more. Most shows and performances require planning ahead and purchasing tickets before the day of the show. A Forbes Four Star, AAA Four Diamond luxury landmark located in the heart of downtown Denver. The Brown Palace Hotel & Spa is a charter member of National Trust Historic Hotels of America. The hotel opened its doors on August 12, 1892 - and hasn&apos;t closed them for a single moment since. This luxurious four-star hotel remains one of the city&apos;s crown jewels today with its stunning stained glass atrium lobby, extravagant suites and extraordinary dining venues. The hotel&apos;s original artesian spring well is located 720 feet deep beneath the lobby floor and still provides water to every faucet in the hotel. Historical tours available. Modeled after the U.S. Capitol, the magnificent Colorado State Capitol is topped by a dome containing more than 200 ounces of real gold. The 13th step on the west side is exactly one mile (5,280 feet) above sea level. 7:30 a.m.-5 p.m. Monday - Friday. Located 20 miles west of Denver at I-70 Exit 254. The city of Denver maintains a herd of buffalo in a natural setting. The Denver Buffalo Herd are direct descendants of the last wild buffalo herd left in America. Enjoy the ongoing and permanent exhibits and displays at the Buffalo Bill&apos;s Museum and Grave. Exhibits include memorabilia from Buffalo Bill&apos;s life and Wild West shows, Indian artifacts, antique firearms and other Old West artifacts. The historical complex on Lookout Mountain includes the Museum, Buffalo Bill&apos;s grave, the Pahaska Tepee gift shop, and a children&apos;s activity area. Open Daily 9 a.m.-5 p.m. (May - October); Tuesday-Sunday 9 a.m.-5 p.m. (November - April). Closed Thanksgiving and Christmas Day. Red Rocks Park & Amphitheatre is a naturally formed, world-famous outdoor venue just 15 miles west of Denver and is the only naturally occurring, acoustically perfect amphitheater in the world. The Visitor Center features interactive educational displays, a short film documentary on the geologic and musical history, a Performer&apos;s Hall of Fame and delicious food at Ship Rock Grille. Red Rocks is recognized for its star-studded concert roster, natural acoustics and ambience, as well as its awe-inspiring hiking and biking trails. Visitor Center open: April-October 7 a.m.-7 p.m.; November - March 8 a.m.-4 p.m. Closed Thanksgiving and Christmas. See the famous collection of Native American art and explore the bold art inside and out of the new Frederic C. Hamilton building, designed by world famous architect, Daniel Libeskind. The Denver Art Museum also offers free general admission on the first Saturday of every month. Open Tuesday - Thursday 10 a.m.-5 p.m.; Friday 10 a.m.-8 p.m.; Saturday-Sunday 10 a.m.-5 p.m. The museum showcases the work of Clyfford Still, considered one of the most important painters of the 20th century and among the first generation of abstract expressionist artists. The Clyfford Still Museum was founded to promote the late artist&apos;s work and legacy. Still&apos;s estate - 2,400 artworks - has been sealed off from the public since 1980. Free tours (with museum admission) on Fridays at 6:30 p.m. and Saturdays at 2 p.m. Open Tuesday-Thursday 10 a.m.-5 p.m., Friday 10 a.m.-8 p.m., Saturday-Sunday 10 a.m.-5 p.m.
Denver&apos;s History Colorado Center includes exhibits and programs that tell the stories of Colorado and engage visitors in the past, present and future of our state! Enjoy interactive exhibits like a virtual ride in a real Model T; testing your skills on a ski jump simulator; and setting off dynamite in a 1880s hard-rock mine. Open daily 10 a.m.-5 p.m.
Denver Union Station has undergone a massive restoration and re-development that has made it an exciting place in the heart of downtown. The 1914 Beaux-Arts station is now a hub for transportation, dining, shopping and entertainment with 112 hotel rooms, four new Colorado chef-owned restaurants, two quick-service restaurants, local one-of-a-kind shops and a Colorado beer hall. Direct rail service connects Denver International Airport and this historic landmark. The Crawford Hotel offers guided tours of the station. A true Western icon, Rockmount Ranch Wear introduced the first Western shirts with snaps and helped popularize Western wear as legitimate American fashion throughout the United States and abroad. The Rockmount building is a historic landmark built in 1909. Open Monday-Friday 8 a.m.-6 p.m.; Saturday 10 a.m.-6 p.m.; Sunday 11 a.m.-4 p.m.
An independent community bookstore, Tattered Cover offers lots of nooks and crannies. It has the intimacy of a smaller bookshop and an ample supply of sofas and chairs. Readers are sure to feel at home. The Lower Downtown (LoDo) location is open every day. Tattered Cover also has a location at Denver Union Station. The Museum of Contemporary Art Denver is an innovative forum for contemporary art that inspires and challenges all audiences, creating understanding and dialog about art of our time. As Denver&apos;s first institution devoted entirely to contemporary art, MCA Denver is housed in an environmentally sustainable facility designed by David Adjaye. Open Tuesday-Thursday 12 p.m.-7 p.m.; Friday 12 p.m.-9 p.m., Saturday and Sunday 10 a.m.-5 p.m.
Denver&apos;s urban shopping and dining district is also the city&apos;s oldest and most historic block. Complete with glittering lights strung over the entire block, Larimer Square is charming and elegant with a nightlife that defines hip urban renewal. Victorian buildings house specialty boutiques and unique chef-driven restaurants. Shop one-of-a-kind stores with distinctive fashion and exclusive offerings. Special events and a vibrant atmosphere year-round. Larimer Street between 14th and 15th streets. More than 160 stores and restaurants including, Macy&apos;s, Neiman Marcus, Nordstrom, Abercrombie & Fitch, Stuart Weitzman, Michael Kors, Hugo Boss and favorites like Gap, Banana Republic, Express, H&M and Forever 21. Visit the guest services desk and ask for your Passport to Shopping offering discounts for more than 60 stores and restaurants. For a quick and easy way from downtown to Cherry Creek Shopping Center take the 83L bus from Civic Center Station and get off at the Fillmore stop. 3000 E. 1st Ave. Open Monday-Saturday 10 a.m.-9 p.m. and Sunday 11 a.m.-6 p.m.
Cherry Creek North is all about atmosphere and authenticity, making any shopping experience one to remember. From unique jewelry and art to couture fashion and accessories, Cherry Creek North has the highest concentration of high-end retail in the region. The 16-block district is also home to an impressive collection of well-established galleries, renowned restaurants, luxurious day spas and more. Located across from the Cherry Creek Shopping Center between 1st and 3rd avenues, Cherry Creek North is a must see for the savvy shopper, art lover or foodie begging for a thrill! Denver&apos;s premier regional outdoor space, City Park is home to the Denver Zoo; the Denver Museum of Nature & Science and IMAX; tennis courts; horseshoes; baseball, football and soccer fields; two lakes; historical monuments and statuary; picnic sites and two playgrounds. Explore the Space exhibit, Exhibition Health, gems & minerals exhibit and the Dinosaur exhibition. The Denver Museum of Nature & Science also features IMAX and a planetarium. Open every day 9 a.m.-5 p.m. The Denver Zoo spans over 75 acres and is home to more than 4,000 animals including rare amur leopards, okapi, black rhinoceros, elephants, vampire bats, orangutan, Komodo dragons and more! The Toyota Elephant Passage exhibit is the largest bull elephant habitat in the world. The zoo&apos;s new Amur tiger habitat, The Edge, will bring guests closer than ever to these magnificent felines. Open every day 9 a.m.-5 p.m. This oasis in the middle of the city has 45 different gardens (some 33,000 plants), as well as one of the nation&apos;s top 10 conservatories. Relax in the Japanese Garden, climb through the Rock Alpine Garden and explore the Mordecai Children&apos;s Garden. Denver Botanic Gardens is open everyday 9 a.m.-5 p.m. Located at the base of the foothills, Golden was the territorial capital until 1867 and remains one of the most historical towns in the state. An arch spanning the street proudly proclaims that Golden is "Where the West Lives!" The legendary Coors Brewery can brew up to 22 million barrels and package up to 16 million barrels annually, making it the biggest single-site brewer in the world. Take a tour highlighting the malting, brewing and packaging processes, ending with a sampling of Coors fine products and shopping in the gift shop! Located 71 miles (114 km) northwest of Denver, Rocky Mountain National Park features 400 square miles (1,036 sq km) of scenic beauty, including Trail Ridge Road, the highest continuous highway in the world crossing the Continental Divide at over two miles above sea level. The park has two information centers, hundreds of miles of hiking trails, tranquil lakes, waterfalls, wildlife and horseback riding. Estes Park is a resort town on the edge of the park with restaurants and shops. Mount Evans has the highest paved auto road in North America snaking its way to the 14,260-foot (4,346 m) summit. The road is open only from the Friday before Memorial Day through the first Monday in October and frequently has snow on it, even in August. (The road closes at Summit Lake after Labor Day, preventing you from reaching the top). The view from the top takes in the entire Front Range. The summit is 60 miles (97 km) from downtown Denver. On your way up the mountain, be sure to stop at M. Walter Pesman Trail (maintained by Denver Botanic Gardens) for a wildflower hike; you won&apos;t see anything like the rare flowers and 1,500-year-old bristlecone pine trees anywhere else in the world. The trail winds through subalpine and alpine areas where wildflowers and animals of the fragile tundra live. Pikes Peak Country is located 60 miles (97 km) south of Denver and features more than 40 attractions centered around 14,000-foot (4,267 m) Pikes Peak and the city of Colorado Springs. Things to see include the Air Force Academy, one of three United States military colleges; the famous Broadmoor Resort with its lake and three golf courses; the Pro Rodeo Hall of Fame with its exhibits on this exciting professional sport; and Garden of the Gods which has gigantic 500-foot (152 m) high red sandstone rock monuments at the base of Pikes Peak. Situated at the foothills of the Rocky Mountains, Fort Collins offers fabulous recreational opportunities, diverse cultural attractions, a vibrant nightlife scene, and plenty of family-friendly activities. Just 65 miles north of Denver (about an hour and 15 minutes drive) on I-25, the town is home to Colorado State University. Explore the city&apos;s 50 parks, 280 miles of trails, including paved and unpaved walking and bike trails, or go for a whitewater adventure on the Cache la Poudre, a river runner&apos;s paradise from May through September. Downtown Fort Collins features a wide array of cuisine and nightlife options, not to mention some great shopping. And of course, no visit to the city would be complete without a trip to the world-famous New Belgium Brewery, a must-see for craft beer aficionados.